For a city with a sub-tropical climate, Hong Kong seems an unlikely place to emerge as the world’s biggest exporter of fine fur garments and accessories with export sales of over HK$2.5 billion and local sales of HK$125 mil in 2007. A lot of the credit goes to two furriers from Shanghai – Stephen Fong and Michael Sun, who started the HK fur industry by setting up the first fur stores and fur factories in HK and their firms remain leading players in the industry today. Business card of Siberian Fur Store from the early 1960s listing all of its branches. A native of Ningbo, Stephen Fong Sun-tou was born into a wealthy family which owned cotton farms and mines. Inspired by his maternal uncle Chen Chor-liang who was a prominent furrier in Shanghai, Stephen Fong chose to become a furrier apprentice at the age of 15 instead of pursuing further education. Through the introduction of his uncle, Fong started working as an apprentice at the Siberian Fur Store on Bubbling Well Road in Shanghai. Founded by a Russian Jew named Gregori Klebanoff (also spelled Klebanov) in 1928, Siberian was one of the leading fur stores in old Shanghai. During his three years of apprenticeship, Fong quickly learned the ins and outs of the fur trade at work and also studied English and business for 3 hours every day before and after work. In 1935, the 18 years old Stephen Fong decided it was time to strike out on his own. Despite not knowing anybody in the British colony, he picked faraway Hong Kong as the location of his new venture as more and more money and people were flowing into the Southern enclave as the war situation in the North intensified, and more importantly – there was virtually no competition (The firm of Ku On Fur 巨安皮草 in Sheung Wan was established in 1879 but it specialized in Chinese style fur jackets). Fong raised US$8000 from his family and friends and brought with him a dozen skilled workers from Shanghai to HK where he established Siberian Fur Store in a 600 sq ft space on Hillwood Road in Tsim Sha Tsui, next to a hair salon patronized by many wealthy ladies. His foresight was proven correct and being the first and only Western style fur store in HK, business was brisk from the start. By 1938 his staff had increased to 30 and he also relocated to a larger space in a 3-story building where the Mira currently is situated. When the Japanese occupied HK in 1941, the store was looted by the Japanese troops but Fong managed to hide some of his most valuable fur in the staircase of his shop. He got by selling second hand cameras but in one incident he was almost killed by a Japanese soldier. Left: The Siberian Fur Store on Bubbling Well Rd in old Shanghai; Right: Siberian Fur Store ad in Shanghai in 1934. After the War, Siberian Fur Store re-opened in HK and business took off as local customers were drawn by the novelty value of fur and streams of US soldiers and tourists came to HK for stopovers during the Korean War and Vietnam War and were attracted by the costs of Siberian’s fur coats which were half of comparable ones in the West. In 1950, a branch was opened in Tokyo and Siberian Fur achieved huge success in the Japanese market. A state of the art fur factory was set up at 68 Kimberley Road in Kowloon in the 1950s, which the Governor Grantham and his wife Maurine visited in 1956. In 1957, the firm re-opened its first branch in Kowloon at Champagne Court at 16 Kimberley Road and Lady Grantham, a loyal Siberian customer (and a semi-expert in fur according to Fong) was the guest of honor. The next year, a second Kowloon branch was added at Ocean View Court at 21 Chatham Road. Emba Mink Store was also opened in 31A Carnavon Road which specialized in the higher end mink coats. In the 1960s, Siberian Fur branches were opened in the new hotels in town such as the HK Hilton and the Mandarin in the HK island side and Park Hotel in the Kowloon side. As more US troops were deployed in Asia as the Vietnam War progressed in the 1960s, Fong established a rep office in Saigon, Vietnam and opened a store in the US base in Guam, boosting sales by offering installment plans to soldiers wanting to buy fur for their loved ones. Aside from the Governor’s wife, Siberian Fur also counted famous celebrities as clients including singer Bing Crosby and actor Larry Hagman. To meet the demand of his fledgling fur store empire, Fong built a factory building at 6 Shing Yip Street in Kwun Tong (later became Modern Warehouse, which was later sold to the Cheung Kong controlled Prosperity REIT and re-developed into Prosperity Place), a first in the industry. Aside from his business acumen, industry expertise and right timing, a few dedicated individuals contributed to Fong’s success. In his early years, he was greatly helped in terms of financing by C.Y. Cheng (程覺民), a director of Bank of Communications who was also an engineer with a PhD in metallurgy from Columbia, whom he invited to become chairman of Siberian. In the 1950s, C.K. Shum (岑主貴) was a major contributor to the expansion of the fur business. When Shum passed away, Fong closed his stores for days in mourning. In the 1960s, a veteran of the shipping industry whom he met at Church by the name of Y.K. Chien (錢要基) helped him diversify into other businesses. One of the businesses which proved to be very lucrative was pharmaceuticals. Through Great Eastern Trading Co, Fong secured the sole agency of Upjohn Pharmaceuticals (now part of Pfizer) in HK which he placed his lieutenant Yu Hin-liang (余顯亮) in charge. But even more profits were made in the real estate space. In the early 1960s, Fong decided to convert the site of the main store on 29 Des Voeux Road Central into an office building. 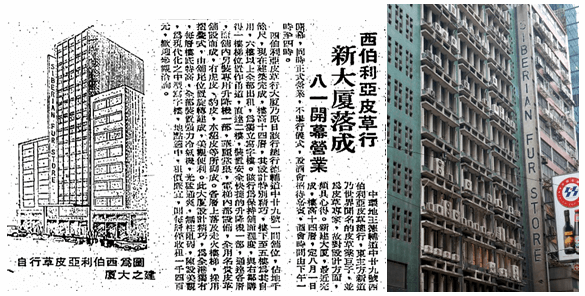 The site, sandwiched between the On Lok Yuen Building and China United Bank Building and acquired from the family of Ho Kom-tong, was deemed too small for a tall building as it is only 17 by 65 sq ft. Unsatisfied by the design proposed by the prominent architect Chau Iu-nin which only went up to 9 story, Fong found a retired British architect who was able to design a 14-story building on the small plot and the building – which Siberian kept the first several floors as its showroom and office and was considered an architectural marvel – opened in August 1967 and is still standing in Central half a century later. Over time, the Fong family built up a portfolio of a dozen commercial and residential properties in HK, US, Canada and Japan which significantly augmented their fortune. 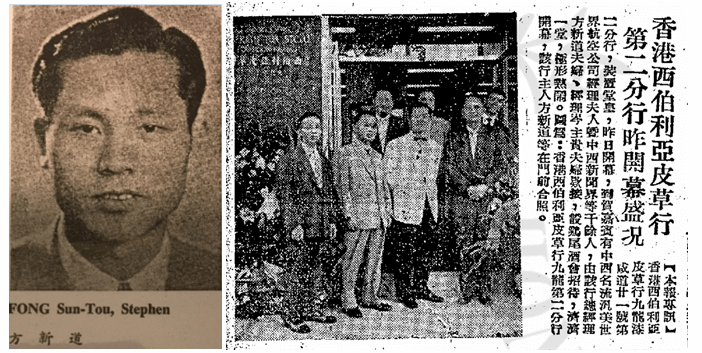 Left: Article about the opening of Siberian Fur Store Building in 1967 (Source: Kung Sheung Daily News, 1967-7-31); Right: Siberian Fur Store signage in Central today. In the 1970s, more overseas branches were added with one in Macau at Hotel Lisboa and another one in Tokyo at the Imperial Hotel. In 1978, Siberian Fur also began exporting to markets such as the US, Europe and Japan. At the height of Siberian’s success, it had over 1000 employees. By the 1980s, there were over 200 firms in the HK fur industry and over 10000 workers, many of them tracing their roots to Siberian and Stephen Fong. Siberian remains the top firm in the industry catering to the highest end clientele that buys million dollar mink coats and Stephen Fong, who had pioneered many fur making techniques since the 1930s, was recognized as a top fur expert globally whose authentication was highly valued around the world. Outside of work, Fong was into martial arts, qigong and table tennis and donated money to his native Ningbo before his death in 1995. He and his wife had 3 daughters and 4 sons and his son John Fong (方國華) and granddaughter Jennifer Fong took over the fur business after his death. Left: cover of Michael Sun’s autobiography published in 2012; Right: Henry Sun (left) at the inauguration dinner of the HKFF board in 2017. Born in Hebei province in 1929, Michael Sun came to HK from Shanghai in 1951. At first he was in the carpet trade with his family but entered the fur business in 1953 when he started selling weasel skins procured from the mainland to furriers. In 1957, he founded HK Fur on Cameron Road in Tsim Sha Tsui, making and selling mink coats (which was relatively rare at the time as most of the fur coats available in the market were made of Chinese weasels and kolinsky) at 2-3 times profits. From 1965, he began to source fur from the UK to make mink coats for exports. By 1968, a workshop was established in To Kwa Wan with 8 apprentices, making coats for English furriers with muskrat bodies and expanded to rabbit fur the next year. In 1971, the total fur exports from HK just reached $1 million. By 1978, exports already exceeded HK$228 million (60% of which going to Japan) and there were around 100 fur factories (3 of which capable of dyeing fur) and 80 fur stores. During the period, HK Fur Factory expanded to the European market in 1973 and the US market in 1978. In 1979, Sun and other 56 other furriers established the Federation of Fur Manufacturers and Dealers (now simply known as HK Fur Federation or HKFF) and he was elected its first chairman. Since 1982, the group has organized the annual HK International Fur and Fashion Fair every year and the group’s membership has increased to 150 today. By the 1980s, HK became the number 1 exporter of fur in the world and in 1986, HK’s fur exports exceeded $2.478 billion (65% of which to Japan, 27.5% to the US), a 35% increase from the previous year thanks to the strong Japanese economy. The industry employed 11000 workers with 200 fur factories in HK (although 30 of them started production in the mainland for cost reasons) and HK Fur Factory with over 500 workers was one of the biggest (there were roughly 50 factories with over 100 workers). 1987 (when exports rose another 40% to $3.5 billion) however was the peak of the market and thanks to a combination of factors including stock market crash, anti-fur movement in the West, over supply and warm weather, worldwide mink production dropped from 44 million to 24 million and fur price dropped 50% in 1988. The early 1990s saw a recovery in the fur market and at the time Sun’s operations included a factory in HK that was employing 200 workers, a factory in Shekou employing another 150, a fur tanning factory which employed 50 workers and 2 retail shops. Today, the group maintains 2 factories in HK and China employing 300 and produces its own house brand – Michelle Fur with two subsidiaries – Henry Fur (Shenzhen) Ltd and Schmidt-Poly Furs (Boluo) Ltd. Since the 1970s, Sun has invested (including setting up fur factories) and donated millions to his native Hebei province. In 1997, Sun immigrated to Canada and left the management of his fur business to his sons – his older son Henry Sun Shiu-tsang (孫紹曾, who joined the family business in 1976 after studies in Australia and also served as chairman of HKFF) in charge of the manufacturing operations while his younger son Thomas Sun (孫紹九) was placed in charge of the retail operations. This article was first posted on 13th October 2017.
what an interesting article! a friend of mine lived above the siberian fur store on chatham road through the seventies, there was a giant stuffed lion with bullet holes on display in the windowl it gave me the creeps every time i went there!! !